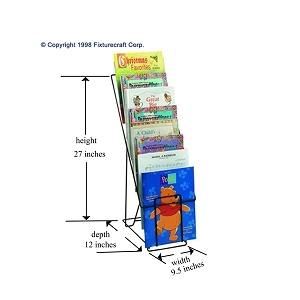 Compact Portable Wire Literature Display and Magazine Display for Counter Tops or Slatwall. 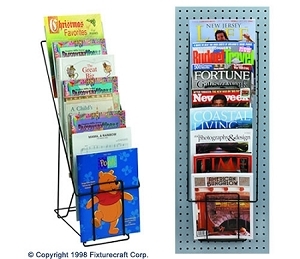 Fixturecraft's Model C8 is a great heavy gauge wire literature counter space saver which displays sheet music, magazines or any 9 1/4" wide material...All within less than one square foot on a counter... Perfect when you just don't have the counter room. Stadium Seating is a big hit with libraries, churches, music stores and at conferences and trade shows for promotional literature displays. Model C8 can also be hung on Slatwall or Pegboard as shown in picture. Just fold open the easel back and you have a high-capacity display. Open size (WxDxH): 9 1/2x12x27 1/2"
We use the Stadium Rack at every exhibit we have during the year. It displays a number of books/brochures, etc. in a small space on a table perfectly and then folds down for shipping. We love this item. What a great find! Rack was on sale, so I purchased it and it's a wonderful little rack. Perfect on the counter. Sheet Music fits perfectly in it. Thank you. Great item! Received this item very fast and in very good condition.